In its 2013 State of the Global Workforce report, Gallup called engaged workers “the lifeblood of their organizations.” Companies with the highest levels of employee engagement have significantly higher productivity, profitability and customer ratings, much lower turnover and absenteeism, and fewer safety incidents than their peers and competitors. If that is true—and who am I to argue with Gallup?—then one of the ways to drain your company of its lifeblood is to micromanage your workers. Lately I have been hearing quite a bit of chatter—complaining, really—about managers who micromanage. Apparently, people do not like being micromanaged. Top executives and star performers find it insulting, and anyone with any sort of a positive work ethic finds it stifling. Being micromanaged tells them that their managers do not trust their work or judgment—so they shut down. They stop making suggestions, and they stop doing their best work. They put in time but little else. Moreover, their apathy is contagious, affecting not only their own productivity but also that of their colleagues. Micromanaged employees easily become disengaged. In CEOs: Beware of Micromanaging I borrowed six questions from The Consequences of Micromanaging that managers can ask themselves to get a sense that they might be micromanagers. If you answer YES to two of these questions, then you are probably micromanaging your employees and may need some help to get out of the micromanaging trap. But let’s take this mini-assessment a little further. Like many things in life, micromanaging is not all-or-nothing; it is not a case of either you micromanage or you don’t. There are levels of micromanagement. Another way to think of micromanagement is the degree of autonomy (and the power and authority that go along with autonomy) that your employees have to do their work. At one end (Level 1) is total micromanagement; employees have no autonomy at all. At the other end (Level 5) employees have the highest level of autonomy. Think of just one routine project that you tasked a staff member or work group with recently. Do not pick an unusual situation that necessarily demanded a higher than routine level of involvement from you—like work you assigned an intern or a new and inexperienced hire. And don’t pick some out of the ordinary and highly critical situation. Stick to something routine. Now, thinking about just this one routine project, read the descriptions of the degree of management and autonomy operating at each level combination of management and autonomy — and identify which level explains your management of that project. Level 1 is pretty much the zenith of micromanagement. Employees have no autonomy at all. You keep all the power and authority, and you control all aspects of the project. You assign the project, and tell your workers what to do and how to do it. The employees may (or may not) be tasked with doing some research on the project—but they do not make any decisions or have any input into what will be done They report their research to you so that you can identify possible alternative courses of action, decide what will be done, and tell them how the work will be done. You monitor every aspect and detail. Level 2 is slightly, but significantly, different from Level 1. You still hold the power and authority to make all decisions. You monitor and control all aspects of the project. However, you allow your employees some input into the decisions you make. The employees do the needed research, identify alternative courses of action and maybe even suggest a preferred one for implementation. You decide which one to implement and how. There is a significant difference between Level 2 and Level 3. At Level 2 employees have input, but at Level 3 they also have power and authority to make decisions. You, however, retain the power and authority to approve or disapprove any and all decisions before they can act. 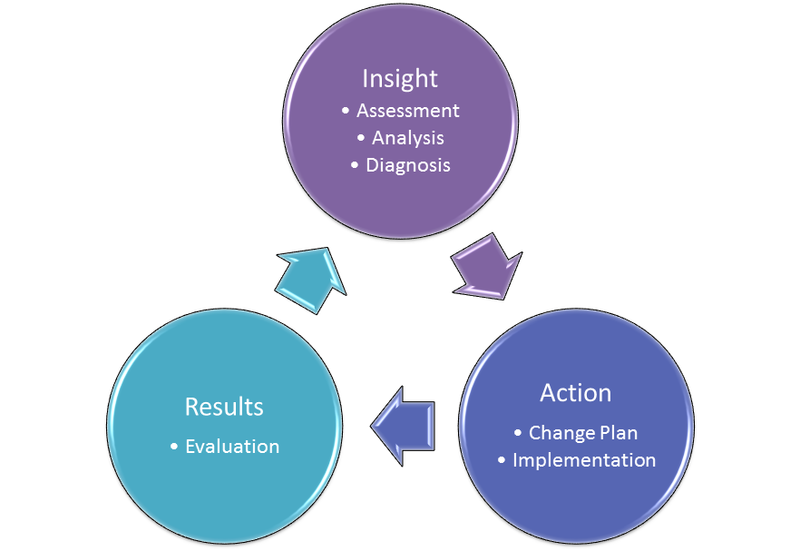 The employees do the research, and they decide which course of action they intend to take. They report to you—and wait for your approval before taking any action. At Level 4 you take a major step away from micromanaging. At Level 4 you hand over real decision-making power and authority to employees—but you hold on to the power to “put on the breaks” at any time. The employees do the research, report what they intend to do—and move forward unless at some point you say “no” or “stop.” Of course, things can get very tricky here: your employees need to know ahead of time what might cause you to say, “no” or “stop” as the project moves forward so they don’t find themselves wasting time, energy and resources heading down a blind alley. Better work on those communication skills if you are going to ease up on the micromanaging! Level 5 is where you really stop micromanaging. You communicate the desired goals and outcomes, the time constraints and the available resources—and then let the employees run with the project. They do the research, develop a plan, take action, and periodically update you on progress. They get help from you when they have questions or when they run into obstacles (because good managers remove obstacles). They give you progress updates, but the project is in their hands. 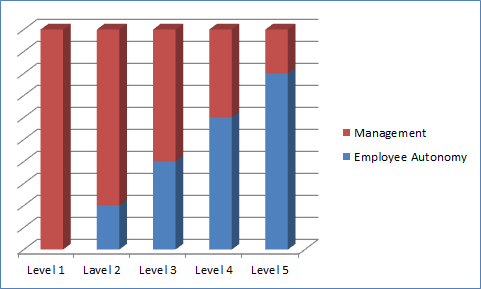 Level 5 is the point where employees feel they have “arrived”. They work on their own and take full responsibility and ownership for their work and projects. They feel that they have earned your trust. They do their best work and are at their most creative and innovative. Is there a pattern in your assessment? Are you generally somewhere in the range of Level 4 and Level 5? If so, then you are doing pretty well when it comes to micromanaging– and just need to learn who to be more consistently at Level 5. However, if you are generally in the range of Levels 1, 2 and 3 – well, you need to consider that you may be standing in your employees’ way and need to take a step back so your company can move forward.